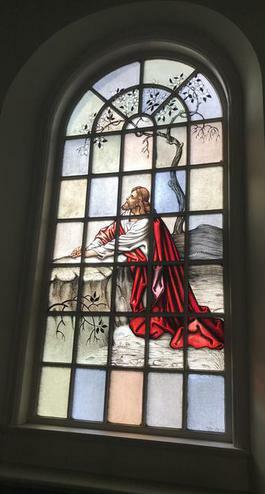 Phillips Church's riveting Gethsemane window depicts Jesus agonizing over his approaching physical pain, separation from the Father and death for the sins of the world. The divine course was set, but he, in his human nature, still struggled. Because of the anguish Jesus experienced, he can relate to our suffering. This stained glass window is in the alcove behind the altar and above the baptistry at Phillips Church. The purpose of Phillips Memorial Baptist Church is to proclaim the gospel of Jesus Christ, to encourage continued individual growth in Christian living, and to extend a cooperative ministry to each other and to the community. Phillips Church, following the teachings and the example of Jesus Christ, practices the immersion of those who have come to faith in God through Jesus Christ. Baptism is an outward sign of his inward reality. Baptism symbolizes one’s belief in the death, burial and resurrection of Jesus for the forgiveness of sin and the newness of life. We welcome those interested in being baptized. To discuss baptism, call the Church Office at 401-467-3300, extension 1. Having been led by the Spirit of God, we affirm our belief in Jesus Christ, our Lord and Savior. We consecrate ourselves to His service and unite with one another in this covenant. We commit ourselves to continued growth as Christians through prayer, study and worship. We will strive for attitudes and actions which will reflect God’s spirit working through us. We will love one another and help one another to think, speak and act as Christians. We will share each other’s joys and endeavor with tenderness and sympathy to bear each other’s burdens and sorrows. We pledge to give regularly of ourselves and our resources to the support of our church and its ministry. As members of this community of faith, we commit ourselves to reach out to the world. In the face of ignorance, poverty, fear or prejudice, we will strive for justice, freedom, dignity and peace. And in all that we do, we will seek to live to the glory of our Lord who has called us out of darkness into His marvelous light.